We spoke with Merric Davidson, publisher of The New Writer, about his magazine, its annual poetry and fiction writing contest, and the future of magazine publishing. Q: How was The New Writer originally conceived? What makes it different from other magazines for writers? A: The magazine was established in 1996, the result of the merger of two small press mags - Acclaim and Quartos. 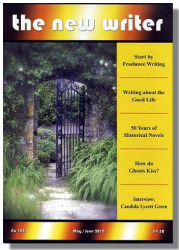 Acclaim published prize-winning short stories and Quartos mostly features by writers for writers. The two came together and we are now on issue 103 of The New Writer (TNW), a magazine which contains in each issue 4 or 5 new short stories, an extensive selection of previously unpublished poetry, a number of articles on writing, plus market news, letters, reviews and a number of regular features. It differs from most other writing magazines in that it is a showcase for subscribers' work, carries no irrelevant advertising, aims to encourage while remaining realistic about available opportunities and, through the monthly eNews, attempts to convey those opportunities to the subscriber base. Q: Could you tell us about your upcoming poetry and fiction writing contest? A: Established in 1997, the annual Prose & Poetry Prizes are now seen as one of the major annual international competitions for short stories, novellas, single poems, poetry collections, essays and articles with cash prizes as well as publication for the prize-winning entrants. Many new writers have gone on to full-length publication and first poetry collections as a direct result of finding success in the competition. You'll find a full list of winners at our website, but it isn't only the prizewinners who benefit - we also publish many of the highly commended entries throughout the year. Q: Although you no longer accept unsolicited fiction manuscripts, you do invite general poetry submissions. What kind of poetry submissions would be of particular interest to you? A: Our guest poetry editor is Abegail Morley whose first collection, How to Pour Madness into a Teacup (Cinnamon Press) has been shortlisted for The Forward Prize Best First Collection 2010 and nominated for the London New Poetry Award. So, two things - I'd definitely recommend getting hold of a copy of that, as well as at least one recent issue of the magazine. Q: What kinds of poetry are you NOT interested in receiving? Are there certain types of submissions that make you think "Oh no, not another one of these!"? A: Not really. Most of the poetry we receive is of a high standard -- after all, we've been around for fourteen years and poets do have a good idea of what we're looking for by now. Obviously, some submissions go to the wall - those that don't really classify or qualify as contemporary poetry, and we don't really look for long epic works unless exceptional. Q: How long have you been the publisher of The New Writer? What are some of the rewards and challenges of publishing a magazine? Are there any ways in which the reality of magazine publishing is different from what you might have imagined starting out? A: When we started Acclaim - I think it was 1992 - the market for special interests magazines was very good. There was a loyalty among subscribers - we had very few readers on board who didn't renew at least once - and a competitiveness among printers which helped no end. You could publish a small run fairly economically and the postage for a subscription-only magazine wasn't crippling, as it is now! I had been in book publishing for twenty years by then and several publishers showed strong support in those early days; the incredible changes in the publishing world since then have all but removed that support so the struggle to survive is constant. There are rewards, of course there are, otherwise we would have discontinued long ago. The excitement of reading fresh, original new voices is something which never leaves you. Watching writers who cut their teeth on TNW as they progress through their career always brings a smile and to be mentioned in dispatches is satisfying although unimportant in the scheme of things. We are a small part-time editorial team of three. We love it or we wouldn't be doing it! Q: How do you see the future of literary magazine publishing? A: Don't get me started! Times are tougher than tough, no signs of improvement, people are looking closely at what they spend on "luxuries" and print looks like being rapidly overtaken by electronic publishing. I could go on but I won't. Who knows where small press magazines will be in five years, certainly not the experts! A lot of literary magazines will end up on the net (and are now). We've just gone quarterly (from bi-monthly) in order to stave off the rising overheads and we hope that by adding an extra dozen pages and providing more openings for our subscribers, that we'll continue to provide a good, rewarding read.